As many of you know I have gone from being nearly homeless, to slowly getting on my feet, to paying back my incredible landlords as they let my daughter and I live rent free until I found work to… well, today. And today? I am a California home owner. Paid for entirely by me. Me???! I have had a dream, a goal, of buying a home for my baby girl since the day I became a single mom. That was 12 years ago. Today that baby girl is 13 and together we found the home of our dreams. A fairy tale place that seems to have been waiting for us. Quietly. Patiently. Lovingly. My daughter took one look and said, This is our home, mommy. This is it. It was worth the wait. I still can’t quite believe it’s ours. Escrow was an intense experience and there were many moments along the way that I was afraid it was all going to fall apart. But the mother lion in me was not going to let my kid down. We had come so far. It was going to happen. I knew it in my gut I would make this happen. It’s not easy to prove you can afford a mortgage when you’re in an industry that is unusual in how it pays it’s artists. I literally had to show them contracts that had been signed to say, “See, the money is coming, it’s just not here yet.” My agents and lawyer and manager all got involved in helping to not only prove my income but to literally help secure it in ways that were so beyond generous it makes me cry to think about it. I had a broker who worked around the clock to find a bank that would accept this single mom, single income gal. I had a realtor who sent me emails daily giving me updates and hope. It seemed nobody was going to let my daughter and me lose this house. Not even the owners who sold it to us. We were truly surrounded by angels. And me? I put every single penny I saved into it, stayed up all night to make sure I had documents scanned, faxed, signed all while working three jobs, packing up our condo and juggling my daughter’s summer schedule. Every day my daughter and I drove by the house just to say hello to it. Every night she showed me pictures of how she wanted to decorate her room and where she wanted her bed to go. We were on a journey. It’s funny, for so long I would feel sad that I wasn’t able to buy a house for my daughter when she was younger. But the truth is having this happen now is so much sweeter. My daughter knows what it’s taken for me to get here. She understands what a big deal this is. She is appreciative of the entire process and she is excited… because what started as a mother’s dream for her daughter… became a daughter’s dream for her mother too. Knowing my home is going to you has been the only thing keeping me from being sad to say goodbye… I love the story of you and your daughter. The story. I suppose we are. I know it’s been my favorite story to write. And as we continued to talk at that Starbucks and she told me about her children being born in that house and her memories of her beloved father who loved spending time in that house, her friends and husband and neighbors and wonderful parties… her eyes lit up and she and I hugged. A house. A new friend. A moment in time. A story. Dancing and hugging and squealing takes over us. Lots of it. Tears and laughter and excitement and celebration. I looked at my daughter as we stood out front of the sold sign. 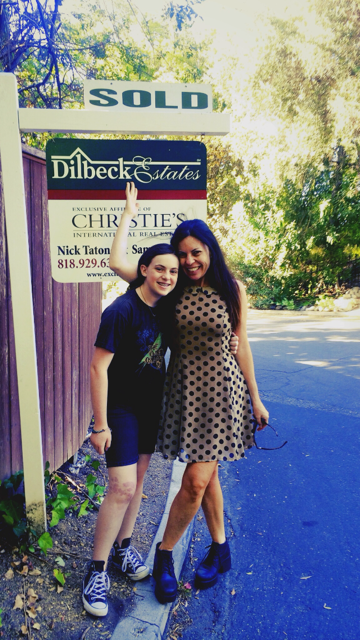 Both of us still in disbelief that the sold sign was there because of us. She took my hand, and her blue eyes stared into mine. Without words we just knew… knew the struggle, the challenges, the long road we had walked together, her in my arms, and side by side, made this moment one of the greatest experiences of our lives. Shared. And she buried her head in my neck and hugged me. not a single mom but a mom in your biz; the anxiety and uncertainty of what we do nests in my belly like a hungry alley cat. your story of success, determination and WORK made me cry but i was crying with a smile on my face. SO happy for you. We can talk to our kids all day long about working hard. Sometimes we get the rare opportunity to actually show them what working hard looks like. Wow. So beautiful!! The things that your struggles, passions, dreams, perseverance, and hard work have taught your daughter are among the greatest gifts you could ever give her. These life lessons and the appreciation for them will never let her down. I am so, so happy for you both!! Incredible Susan! Huge congratulations! I’ve been following your journey since the beginning of Patch. Your perseverance, optimism and humor are inspiring. I wish you and your daughter continued happiness in your new home. This one brought tears to my eyes Susan! Your story is so poignant and heart-touching. May much love and joy reside in your new home forever! SO EXCITED FOR BOTH OF YOU!! !